Photos provided by Christen Minnick, Robin Bell, Occupy Freedom LA, and anonymous GCU Field Agents. 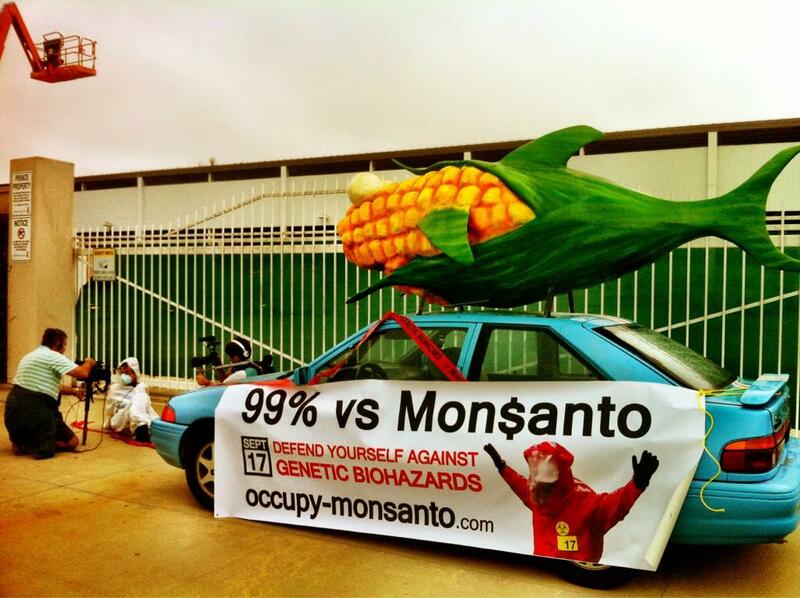 (Reuters) – Opponents of genetically engineered foods on Wednesday blocked shipments and deliveries at Monsanto Co’s vegetable seed company in California that developed a new genetically modified sweet corn that will hit stores this fall. The protesters, who want to remove all so-called genetically modified organisms (GMOs) from the food supply, say their action is a preview of about five dozen other events planned for countries around the world next week. They also hope to drum up support for a California ballot measure that would require food sellers to label a broad range of products, including soup, soy milk, breakfast cereals and chips, that contain GMOs. Monsanto and other developers of these biotech crops say they are safe. But U.S. regulators do not require any independent safety tests that would put a lid on doubts raised by consumers and some scientific and health groups. More than 40 countries around the world have some requirements for labeling foods containing ingredients from genetically modified crops. But U.S. regulators have rejected requests by many groups for similar labeling rules, and as a result many Americans do not know that they have been eating GMOs for years. 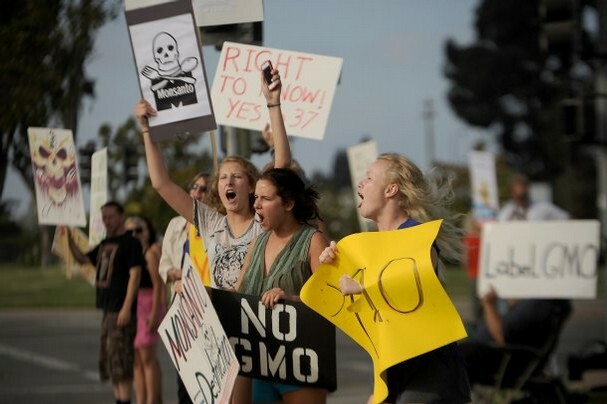 At the protest on Wednesday, about a dozen people organized by a network of anti-GMO activists called Occupy Monsanto stopped trucks from entering or leaving Monsanto’s Oxnard, California-based Seminis for nearly six hours. 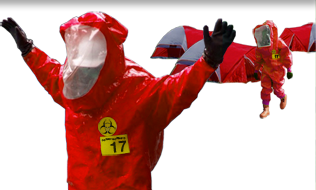 The activists, some dressed in biohazard suits, blocked truck entrances with cars and chained themselves to the vehicles. Police arrested nine of the protesters and charged them with trespassing, organizers said. Seminis’ biotech sweet corn is one of the newest GMO crop products to make it to market. The corn was altered genetically to withstand dousings of a common weedkiller and to ward off certain pests. “We deserve to know what we are eating and we should put GMO crops back in the lab and off the kitchen table,” protester Rica Madrid said. 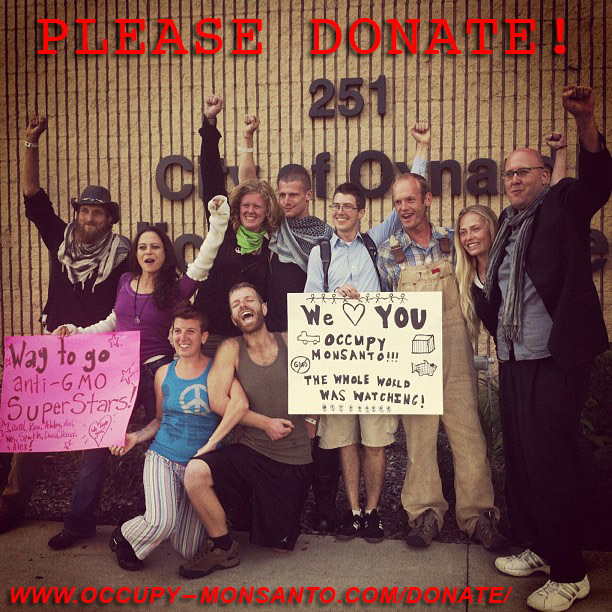 Occupy Monsanto is not affiliated with the backers of a California proposal to label foods that are made with crops or from animals that have had their genetic makeup altered in the laboratory. Monsanto did not directly address Wednesday’s events but said the company’s work helped improve farm productivity and food quality. “We respect each individual’s right to express their point of view on these topics,” Thomas Helscher, a Monsanto spokesman, said of the Seminis protest. 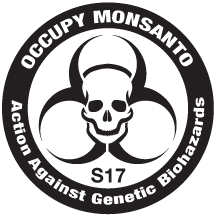 GMOs are deeply unpopular in Europe and many other countries, but they eventually came to dominate key crops in the United States after Monsanto in 1996 introduced a soybean genetically altered to tolerate Monsanto’s Roundup weed killer. Using genes from other species, Monsanto and rivals including DuPont and Dow Chemical have since introduced an array of genetically altered crop varieties. The most popular genetically engineered crops in the United States include corn, soybeans, sugar beets and canola – staple ingredients in a wide array of popular packaged foods. Proponents of GM crops say they make farming more efficient by making plants resistant to pesticides, pests and harsh growing conditions, such as drought. They say genetically modified crops are no different from conventional types and that increasing demand for food, biofuels and livestock feed can only be met with help from the biotech industry that Monsanto dominates. Critics say GM crops have not always lived up to their promise and that the benefits to farmers do not outweigh myriad risks to human and animal health and to the environment. Assessing such risks is difficult in the United States. The government does not require GMO crops to undergo independent safety testing before they are approved, and it does not require labeling for GMO content which makes it next to impossible to track any links to human health problems. Recently, some U.S. scientists have raised alarm bells over what they see as potentially dangerous implications from overuse of GMO crops. Among the concerns is the fact that the rapid adoption by U.S. farmers of genetically engineered corn, soybeans and cotton has promoted increased use of herbicides, which critics say has triggered an epidemic of herbicide-resistant weeds and more chemical residues in foods. This week, the Center for Food Safety vowed to sue the U.S. government if it approves a new type of genetically altered corn developed by Dow. By Carol Lawrence, September 12, 2012 at 6:45 p.m. 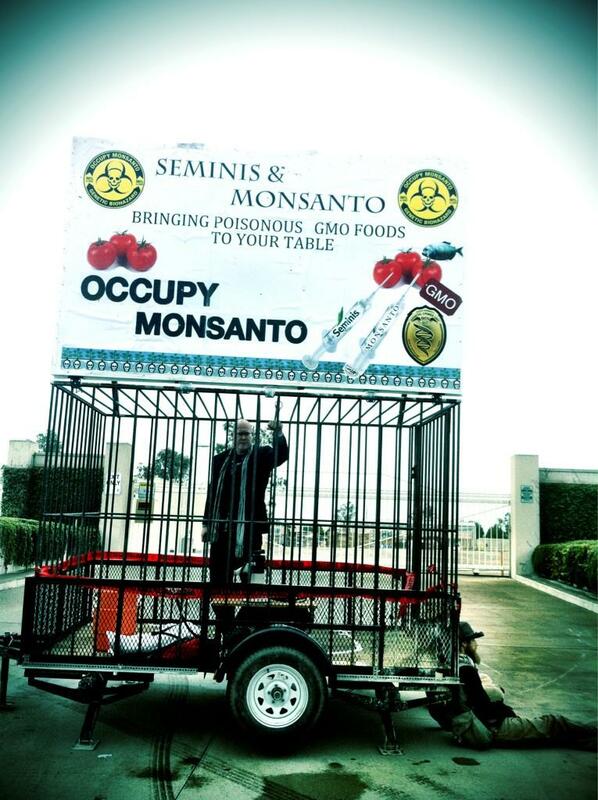 Activists with Occupy Monsanto chained and shackled themselves to cars and cages Wednesday at Monsanto Co.’s seed plant Seminis Vegetable Seeds Inc. in Oxnard to protest genetically modified seeds and foods. 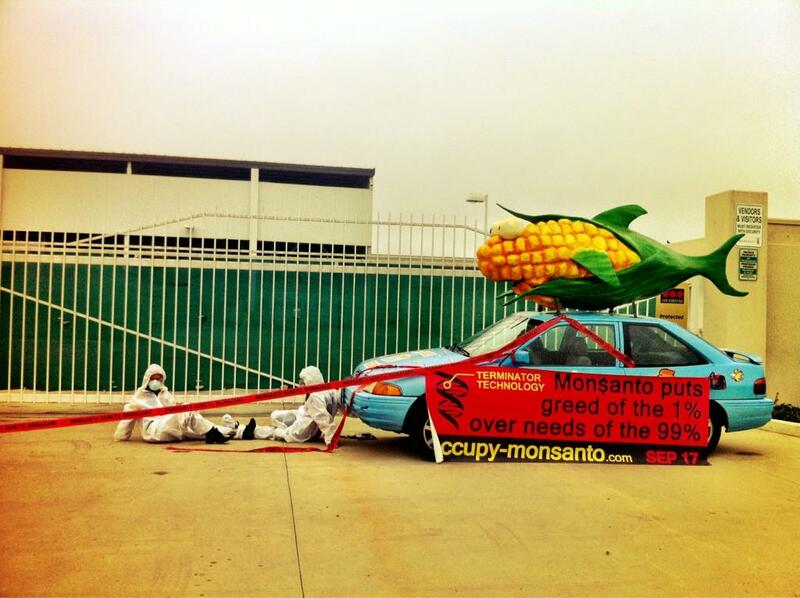 Nine members of the activist group Occupy Monsanto were arrested on suspicion of trespassing Wednesday at the chemical maker Monsanto Co.’s seed plant in Oxnard. Oxnard Police Department Cmdr. Eric Sonstegard said five men and four women age 23 to 42 were arrested after they blocked three shipping and receiving gates at the Seminis Vegetable Seeds Inc. plant on Camino Del Sol. Three were from San Francisco. The others were from Petaluma, Garberville, Oakland, North Hollywood, New York and Washington, D.C. The police went because trucks were unable to get through the gate and the company couldn’t do business, Sonstegard said. “Seminis wanted them to leave,” Sonstegard said. All the protesters were “extremely cooperative,” he said, but also indicated they would not leave. Officers had to call on the Oxnard Fire Department to help remove the protesters, who were locked to their vehicles and shackled together, Sonstegard said. He said the group has targeted the plant before but that this was the first time there had been arrests. Occupy Monsanto activist Rea Abileah said the group held the protest to begin its upcoming global week of actions against Monsanto starting Monday, with similar events to take place at other company facilities in the U.S. and overseas. 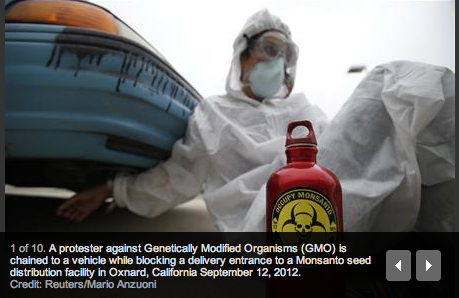 “This is a protest of Monsanto’s genetically modified seeds and toxic pesticides,” Abileah said. She said there were about 23 protesters and they wanted to shut down shipping and distribution operations. The broader goal is to educate the public, she added. Abileah said the action wasn’t specifically related to California’s Proposition 37, a November ballot measure that would require labeling on most processed foods to explain whether they have ingredients from genetically modified organisms. Adam Eidinger, Occupy Monsanto’s representative in Washington, D.C., said the organization thinks all modified foods should be banned. “Genetically modified food is an experiment and should be treated as such,” Eidinger said. On its website, Seminis says it is the world’s largest developer, grower and marketer of vegetable seeds, with examples such as Gemini virus-resistant tomato seeds. Tom Helscher with corporate affairs for Monsanto, which has headquarters in St. Louis, said the challenges facing agriculture are producing food for a growing population and reducing agriculture’s footprint on the environment. “While we respect each individual’s right to express their point of view on these topics, we do not believe unlawful actions are an appropriate way to further any cause,” Helscher said.